Bell, Susan G., ed. Women: From the Greeks to the French Revolution. Stanford University Press,1981. While coming from a broad sociological perspective, this does contain substantial references to Judeo-Christian perspectives and practices toward women, from the Old Testament period right through the Reformation. Clark, Elizabeth A. Women in the Early Church: Message of the Fathers of the Church. Wilmington, Del. : Michael Glazier, Inc., 1983. This excellent collection from the church fathers’ writings regarding women presents some fascinating—and disturbing—points of view. We cite it extensively in “From the Archives” (pp.32–35). Fiorenza, Elizabeth Schussler. In Memory of Her: A Feminist Theological Reconstruction of Christian Origins. New York: Crossroad, 1983. A remarkable historical reconstruction, though it doesn’t concentrate exclusively on the early church. Gryson, Roger. The Ministry of Women in the Early Church. Collegeville, Minn.: Liturgical Press, 1980. A detailed history drawn from early church documents, it tilts against women’s full participation in church leadership. Heine, Susanne. Women and Early Christianity: Are the Feminist Scholars Right? London: SCM Press Ltd., 1987. An irenic analysis of the unique insights that feminist scholars have brought to biblical and early—church historical exegesis. LaPorte, Jean. The Role of Women in Early Christianity. New York: Edwin Mellon, 1982. A good collection of primary documents that mention women. Pomeroy, Sarah B. Goddesses, Whores, Wives, and Slaves: Women in Classical Antiquity. New York: Schocken Books, 1975. Recounts and analyzes numerous ancient writings referring to women in various roles, and of various economic classes. Ruether, Rosemary, and McLaughlin, Eleanor, eds. Women of Spirit: Female Leadership in the Jewish and Christian Tradition. New York: Simon & Schuster, 1979. The first two chapters, by Elisabeth Schussler Fiorenza and Ruether, cover the early church. Fiorenza looks at broad sweeps of theology and heresy. Ruether looks at the people, providing helpful overviews of Macrina, Paula, Marcella, and the Melanias Elder and Younger. Seltman, Charles. Women in Antiquity. Westport, Conn.: Hyperion Press, 1981. Spans the records of the ancient Western world to see how women were treated from Athens to Egypt to Crete. Tucker, Ruth A., and Liefeld, Walter. Daughters of the Church. Grand Rapids: Zondervan/Academie Books, 1987. 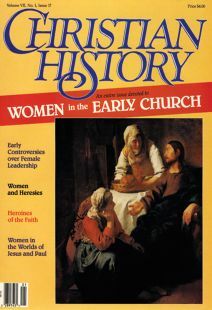 An extensive overview of women throughout church history. Pp. 9–10 of this magazine contain an excerpt from an early chapter. Wilson-Kastner, Patricia, et al. Women Writers of the Early Church. New York: University Press of America,1981. Much new information is presented in this rare collection of primary writings by early Christian women. Clark, Stephen B. Man and Woman in Christ: An Examination of the Roles of Men and Women in Light of Scripture and the Social Sciences. Ann Arbor, Mich.: Servant, 1980. A conservative Catholic approach to the biblical data. Hayter, Mary. The New Eve in Christ. Grand Rapids: Eerdmans, 1987. This new book takes a non-partisan approach, trying to cut through the shallow rhetoric and misuse of Scripture on both sides of the debate. Howe, Margaret E. Women and Church Leadership. Grand Rapids: Zondervan,1982. A solid argument for changing women’s position in today’s churches. Hurley, James B. Man and Woman in Biblical Perspective. Grand Rapids: Zondervan, 1981. A traditional approach, though with some modifications, from an evangelical Presbyterian scholar. Martin, Faith. Call Me Blessed: The Emerging Christian Woman. Grand Rapids: Eerdmans, 1988. Mickelson, Alvera, ed. Women, Authority, and the Bible. Downers Grove, Ill.: InterVarsity Press,1986. Papers from the Evangelical Colloquium on Women and the Bible, 1984. More than 20 writers contribute, from all sides of the issues. Some new interpretations, some old. A ground-breaking collection. Scanzoni, Letha Dawson, and Hardesty, Nancy. All We’re Meant to Be. Nashville:Abingdon,1986. The 1973 classic that set in motion a substantial biblical feminism has been revised. The book was controversial then and may still be, but even staunch traditionalists should admire the authors’ efforts to understand Scripture rather than discard it. Spencer, Aida Besancon. Beyond the Curse. Nashville: Thomas Nelson, 1985. An exegetical study of women in the New Testament. Stagg, Evelyn, and Stagg, Frank. Women in the World of Jesus. Philadelphia: Westminster Press, 1978. More on the theme they explore in this issue (pp.29–30). Deen. Edith. Great Women of the Christian Faith. Westwood, N.J.: Barbour &Co., 1986. A reprint of the 1959 standard. Hardesty, Nancy A. Great Women of Faith: The Strength and Influence of Christian Women. Grand Rapids: Baker, 1980. Easy-to-read biographical sketched. Hardesty is strongest in the 1700–1900 period, but does include Paula, Marcella and Pulcheria. Wright, Elliot. Holy Company: Christian Heroes and Heroines. New York: Macmillan, 1980. A readable collection of biographies of men and women through the centuries, it includes short sections on Macrina and her brothers, Olympias, and Perpetua and Felicitas.